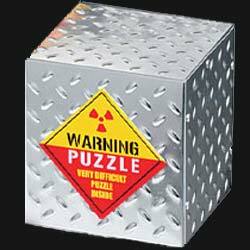 Warning is one of three puzzles in The World's Toughest Puzzle range. The puzzle comes housed in a cardboard box which has a five sided metal top that fits snuggly over the box. Inside are 36 cardboard tiles. Each tile has four different American road signs printed on it. The aim of the puzzle is simple: construct a 6x6 square in which the corner of each tile shows the same image as the corner of the tiles it is touching. When you open the puzzle for the very first time you may, if you're observant, you'll realise that the pieces have been put into the box in the correct order. So, that all you have to do to solve the puzzle is take them out of the box and start laying them down from the top left hand corner - lay out the first six cards and then move underneath the first card to start the second row. But even if you do that, and then mix the piece up again, it'll still take you quite some time to solve the puzzle a second time - and in the end I guess it's more down to actual luck than any real skill. While we've printed a picture of the finished puzzle below, to show you what it should look like, don't worry this won't spoil the puzzle for you. You'll have to print the picture off and copy it to complete it. Simply glancing at the picture below is not going to be of any use - unless you have a true photographic memory. The construction of the components of this puzzle is more than adequate. While the tiles are made from card, it's quite thick and they won't get damaged very easily. The metal outer packaging is also an interesting touch and gives the final product a well polished feel. 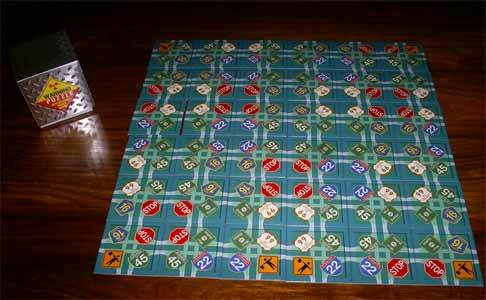 It's a pretty good value for money puzzle which the whole family can enjoy.